Ron Edge is sorting through his collections and finding forgotten things. One of these we print below as an “Edge Clipping”. (Whenever you see the ALKI logo above you can depend that there will be an Edge Cllipping below it.) We use the term “Edge Clipping” for Ron’s offerings as wide as they range, and here it is an old photo postcard he has lifted from his really well-ordered horde. And it is yet another early 20th local subject by Oakes, who has appeared “in these pages” many times past. The text below Ron’s “clipping” is from a Times “Now and Then” feature I wrote for Pacific, and it appeared on August 15, 1989. The “now” photo printed beside a different photograph of the fire station #8 (I mean, not this one) shows that a tennis court replaced the station – or was in its place in 1989. Perhaps Jean will return to the site again and find out what is there now – if it is something other than the grand new Queen Anne standpipe that we featured here last January 3, when Pacific also ran a sidebar explaining my tongue-in-cheek part in a local hoax. Happy reading and Keep Clam and My oh My. Another early 20th Century "Real Photo Postcard" by Oakes. This on of both the Queen Anne standpipe (two of them) and Fire Station No. 8. A QUEEN ANNE MISSION – is the title The Times gave to the story below. Of the fanciful fire stations built in Seattle in the 20 years or so following the city’s Great Fire of 1889, Queen Anne Hill’s Engine House No. 8 was a unique creation – although it had its double. The Mission-style building featured curvilinear gables on the front-center wall over a small balcony (with flower pots), and to either side (of the gables) there were low-pitch roofs with wide eaves and exposed supporting rafters. The bell tower with its arched windows also fits the style, although this tower is for hanging hoses, not bells. 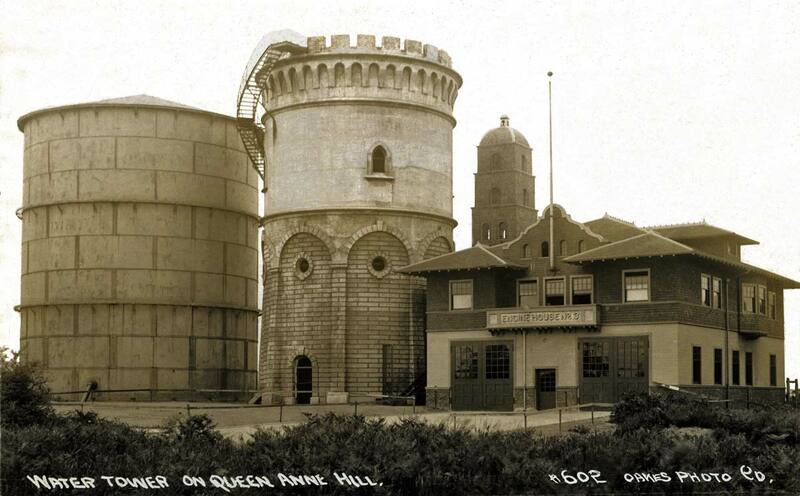 It stands next to another “imposter”, the Queen Anne water tower, which is decorated with battlements at its top. The standpipe was built in 1900 as part of the city’s then-new Cedar River gravity system. The bleaker steel “beaker” (without pouring spout) was soon added by a water department that in between No. 1 and No.2 lost its urge for elegance. Great photo. I lived around the corner from the water towers and (new) firestation for years. However, where this old fire station appears are our tennis courts. Thanks for filling in the (memory) gaps, now the style of the water towers (gone now also) makes sense.